AS THE Australian Imperial Force set about recruiting troops throughout August 1914 to send to Europe in support of the British, there was a more immediate concern about the threat of German naval power on its own doorstep. Since the 1880s, Germany had annexed territory in New Guinea and surrounding islands such as New Britain, and had established a series of wireless and telegraph stations that allowed German ships both freedom of movement and the ability to communicate rapidly over long distances. On August 10, highly regarded Boer War veteran Colonel William Holmes was appointed to command the Australian Naval and Military Expeditionary Force (AN&MEF), whose mission would be to sezie German New Guinea and destroy the wireless stations. To say Col Holmes did not have much time to pull this force together would be an understatement. 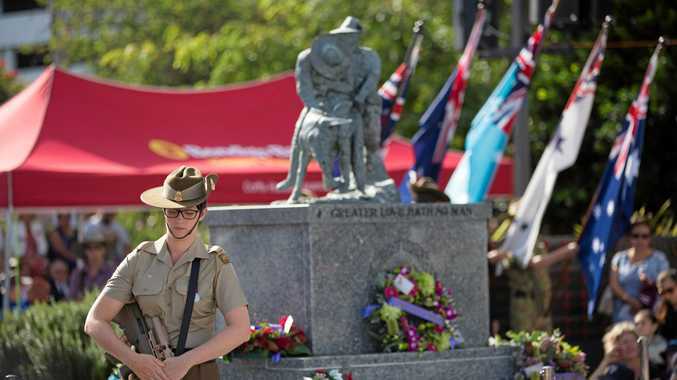 In eight days days, he had recruited, equipped and embarked a 1000-strong infantry battalion, 500 naval reservists and ex-seamen, and a 500-strong citizen battalion from north Queensland (who were later sent home when it was decided they were not fit for battle). The majority of the force consisted of untrained men who had rushed to enlist at the outbreak of war. On August 18, HMAT Berrima departed Sydney's Cockatoo Island, where it had been dry-docked for an urgent refit to install weaponry and allow it the capacity to hold 1500 men. The Berrima would be given almost the entire might of the Royal Australian Navy fleet for protection, led by flagship HMAS Australia, because it was believed the German East Asia cruiser squadron was operating around Rabaul, New Guinea, at the time. Almost a week after its departure, the Berrima dropped anchor off Palm Island, near Townsville, to wait for HMAS Australia, giving the inexperienced servicemen the chance to practice their landing procedures and drills in terrain that would be similar to what they could expect in New Guinea. They were there for a week. The men of the naval brigade who had been selected for the initial landings were transferred from the Berrima to HMAS Sydney, which later met up with the remainder of the ships appointed to the mission in Port Moresby Harbour, including the requisitioned civilian vessel Kanowna. On the Kanowna were 500 keen but motley Queensland volunteers whom Col Holmes did not believe were up to scratch, and a bunch of stokers who had not volunteered for active duty and did not want to be there. When the stokers later mutinied on finding out what their mission was to be, the vessel's fate was sealed - it was sent home, where many of the disappointed volunteers re-enlisted for the AIF. The remainder of the contingent sailed to Rabaul without mishap. And so it was that 100 years ago today, in the early hours of September 11, two landing parties of 25 men came ashore - one at Herbertshohe, and the other led by Lieutenant Rowland Bowen off Kabakaul Bay, about 35km east of Rabaul. Lt Bowen's orders were to advance up the Bitapaka road and seize the wireless tower believed to be about 7km inland. 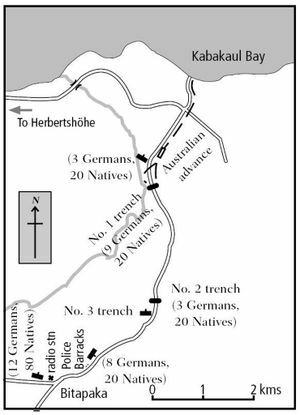 Having encountered no naval formations or coastal defences, the Australians advanced through the scrub relatively quickly for about 2km until they encountered their first opposition - about 20 New Guineans and three German officers dug into the road ahead in wait for them. The Australians captured the group, wounding one of the German officers in the process, and located a map on one of the prisoners revealing German plans to resist the attacking troops by means of a system of trenches, rifle pits and mines. Before continuing along the road to Bitapaka, Lt Bowen called for reinforcements and left a small party behind to ferry messages and direct the back-up troops. That smaller group was later ambushed before Lt Commander Charles Elwell and his 50 men could get there, and Able Seaman Billy Williams and medic Captain Brian Pockley were seriously wounded. They died later that afternoon. The Australians continued to face opposition as they advanced - Lt Bowen was shot in the head but miraculously recovered, but LCDRcorrect Elwell was not so lucky. He was fatally shot in the heart. 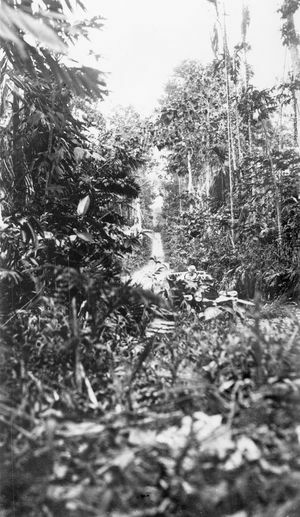 About 7pm, after six Australians, three Germans and about 30 New Guinean soldiers had been killed, the AN&MEF captured the wireless station they had been tasked to take, and two days later the Australian flag was raised at Rabaul after the commanders landed a garrison there and occupied the island. According to Australian War Memorial historian Danial Oakman: "Australia's first action in the war certainly made headlines at the time. Naturally, the magnitude of Australian losses in Gallipoli and the Western Front quickly pushed these stories to the fringes of popular memory. 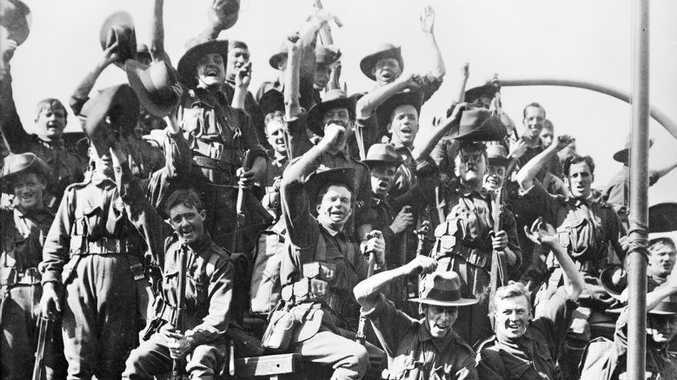 "But Australians in 1914 knew that the war had come to their part of the world." Pockley, 24, was a gifted student and sportsman who had studied medicine at the University of Sydney and qualified as a surgeon only six months before the outbreak of the war. He had applied for a commission in the Australian Imperial Force (AIF), and was appointed a captain in the AN&MEF heading for German New Guinea. Pockley was with the first naval brigade landing party at Kabakaul on September 11. As the group advanced along the Bitapaka road and encountered the first group of German and local soldiers, a German officer's hand was shattered from an Australian gunshot wound. After the German - who held important information and maps - had been taken prisoner, Pockley pointed out to his commanding officer that the man's injury was serious and he would die without treatment. The medic then performed a field amputation on the enemy officer's hand while the patient bit down on a cigar. Later, when Pockley learned that Able Seaman Billy Williams - who had been left behind the main party with Leading Stoker William Kember to keep watch - had been seriously wounded in an enemy ambush, his act of gallantry would lead to his death. Pockley instructed Kember to carry Williams back to the beach for treatment, removing his Red Cross armband and tying it to Kember's hat in an attempt to give him safe passage back. Not long afterwards, as Pockley and a fellow sailor moved to rejoin the main party, they were ambushed by soldiers hiding in the thick scrub and he was shot in the stomach. The bullet passed right through him and shattered several vertebrae. He died later that afternoon, his efforts earning him a mention in despatches. Tragically, Pockley had written a letter to his family the day before his death, but they would not receive it until after he had perished. He wrote of the conditions: "We are only 5 degrees from the equator at present and it is jolly hot, especially at night, as all the deck lights are closed to ensure a dark ship, and consequently there is not a breath of air. I have just come out of the ship's surgery. It was 95 degrees (35C) there." Talking of the next day's operation, he predicted: "Probably there will be no opposition at all ... personally I think it will be a very pleasant little picnic." Pockley was initially buried alongside AB Williams at Herbertshohe Cemetery, but his remains were reinterred at Rabaul Cemetery on July 11, 1919, with full naval and military honours.